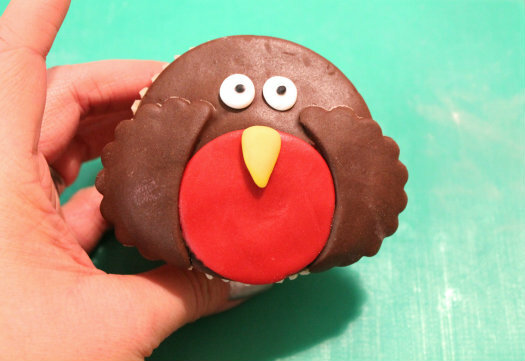 These little Robin cupcakes make a perfect treat this christmas. So simple even the kids can get involved! So what you waiting for? Assorted round cutters (preferably double sided straight and fluted edged). I purchased mine for £1 from Asda (Walmart). Icing sugar for rolling out on. Water (for gluing sugar paste) or as I like to use 1tsp vodka to 1tsp of light corn oil, as not only does it act as glue, but also makes a fantastic gloss too). Taking your spatula cover the tops of your cupcakes with a thin layer of buttercream. Roll out some chocolate sugarpaste (not too thin) and taking a cutter who’s circumference is the same as the top of your cupcake, punch out a circle and place it on top of your cake. Roll out the red sugarpaste and using a smaller round cutter punch out a small circle for his breast, and stick in place with a little water or edible glue. To make the wings, roll out a little more chocolate sugarpaste and using the fluted edge of the small cutter punch out a circle and then using a knife cut the circle in half. Stick in place, curving slightly around the red circle to give shape. Roll a little yellow or orange sugar paste and make it into a triangle for his beak and roll two tiny balls of white sugarpaste to make his eyes and stick into place. Finish by adding tiny dots to the centre of his eyes either with a black edible food pen, or two tiny bits of chocolate sugarpaste for his pupils.